← Oh, the places I’ve been! 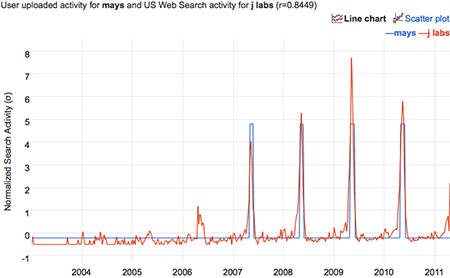 I’m not actually a shill for Google Labs, although it may seem that way from all my recent (and ongoing) attention to the Google Ngram Viewer: four posts (1, 2, 3, 4) and an American Scientist column, so far. What I particularly like about Google Labs is that they share their toys. They create Big Data projects that everybody can play with. For those of us without a server farm on the back 40, that’s a rare opportunity. In other words, the gradual rise in interest rates during the early 2000s was paralleled by a steady growth in the number of people seeking help in identifying the contents of mysterious unlabeled vials in the medicine cabinet. 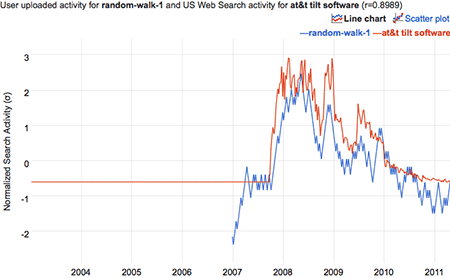 Then, sometime in 2007, both trends reversed direction. Why should these particular variables be so closely correlated? If there is a reason, I have no idea what it is. And I must immediately insert the obligatory disclaimer: Correlation is not causation. Emphatically so in this case. 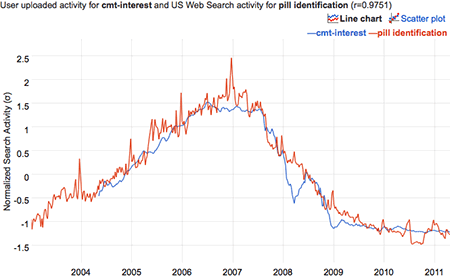 If you are trying to predict the future course of interest rates, I do not recommend tracking popular interest in pill identification. Or vice versa. 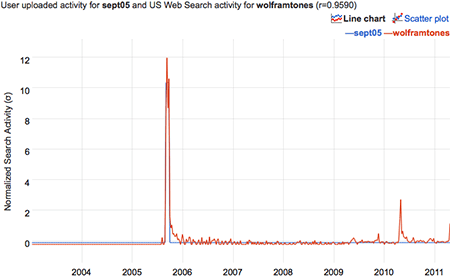 A time series that has all of its energy concentrated in a single pulse elicits from the database a variety of flash-in-the-pan topics—queries that came and went and were never heard of again. Without too much work we could enumerate all such one-month wonders. In our Approximate Nearest Neighbor (ANN) system, we achieve a good balance of precision and speed by using a two-pass hash-based system. In the first pass, we compute an approximate distance from the target series to a hash of each series in our database. In the second pass, we compute the exact distance function on the top results returned from the first pass. 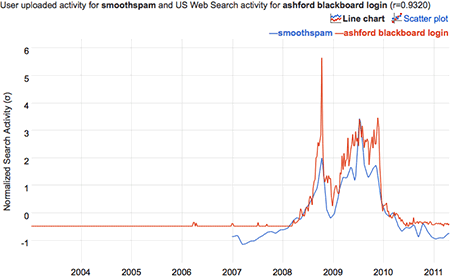 Thus the basic strategy is precomputation: Spend a lot of time in advance computing a succinct signature or hash associated with each time series in the database; then quickly compare hash values when looking to match a submitted time series. I didn’t know until just a few minutes ago that frutti di mare was a dish to be eaten at the winter solstice. 6 Responses to Only correlate! Google is all about precomputation. My favorite example of correlation-not-causation: A table showing the correlation between smoking and lung cancer on a country-by-country basis in a certain scientific magazine was followed, some months later, by a letter to the editor containing a similar table, showing the country-by-country correlation between smoking and cholera. The more smoking, the less cholera. I had a few minutes of fun searching for times of the day (5 AM, 11 AM, 2 PM, 4PM…) and then for angle measures (60 degrees, 75 degrees, 90 degrees, 105 degrees…). It appears that when someone needs a calculator, everybody needs it! This is quite interesting. Surely you can use this to analyze various things, I’m especially thinking it can be useful when doing marketing. Thanks for the great post. I don’t come from a math background but rather a marketing background. Alot of my real world data is on a monthly basis. I noticed in your post that so was your and that you were able to smooth it out to provide weekly data. How do you go about doing that? I first converted from monthly to daily data, dividing each monthly total by the number of days in that month. Then it’s easy to create weekly tallies by summing up successive seven-day periods. In the monthly-to-daily conversion, you may have to deal with leap-year issues—the bane of all calendrical calculations. But weeks are sweet; every one of them has exactly seven days. 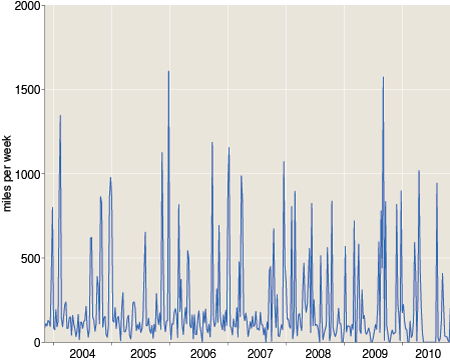 You might also want to do some smoothing of the daily counts, using a moving-window average. (That is to say, you replace each daily value by the average—which might be a weighted average—of that value and the k preceding and following values.) In my case I found that smoothing did not have a large effect on the results. 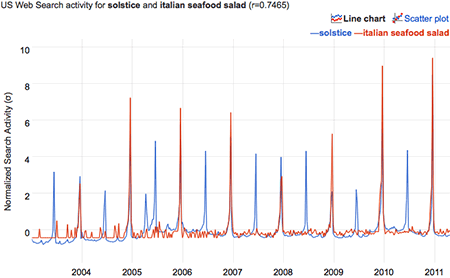 Well, I’ve never seen anybody eating frutti di mare on winter solstice in Italy. I think you would even have trouble finding them in the supermarket in december.